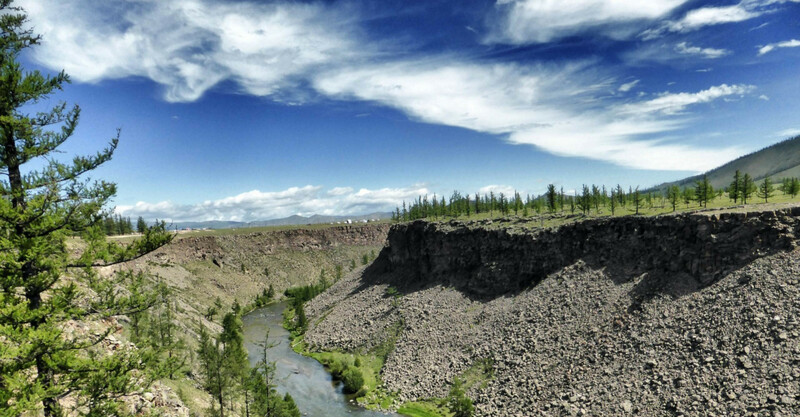 Located in Arkhangai Province, the Chuluut River 415 kilometers long and covers 10,750 square km. This river pours from the tallest point in the Khangain Mountains, so it is one of the fastest flowing mountain rivers. Its valley is narrow with lots of rocks, and the lower its altitude, the wider it becomes. Its falls are than 100 km tall and 60 meters of thick thick basalt rock have been cut by the Teel Rivers flow, leading to peaceful outlets like Artsats brooks and ponds. Mountain water from the east and Terkh Tsagaan Lake comes together to make the Chuluut River flow and reach depths of up to 80 meters. The average depth is 2.5 meters, with a flow of 1 meter per second. Dean is almost as tall as 9 stories and incredibly steep. The flow is at first calm, and when it reaches the dean it looks like stone flow.